We have yet to have a hard frost, which is okay by me until I get the kale in for cleaning and freezing. Despite weird weather, this year was the best ever for our home garden. It seems I should say more about it than that. Truth is I’ve been bedridden the last 48 hours, spewing mucus into tissues without end. I’m over the worst of it, feeling more like working at my desk under lamplight and the glow of my monitor in the wee hours of morning. The last two days seem lost in endless fits of coughing. The two times I went outside to get the mail the weather was perfect for fall. The ice box was getting overfilled with greens from fall CSA shares. Despite my punk feelings I cleaned eight varieties and made a vegetable broth using them with traditional celery, onion and carrots. This set the stage for other dishes to use the abundance. 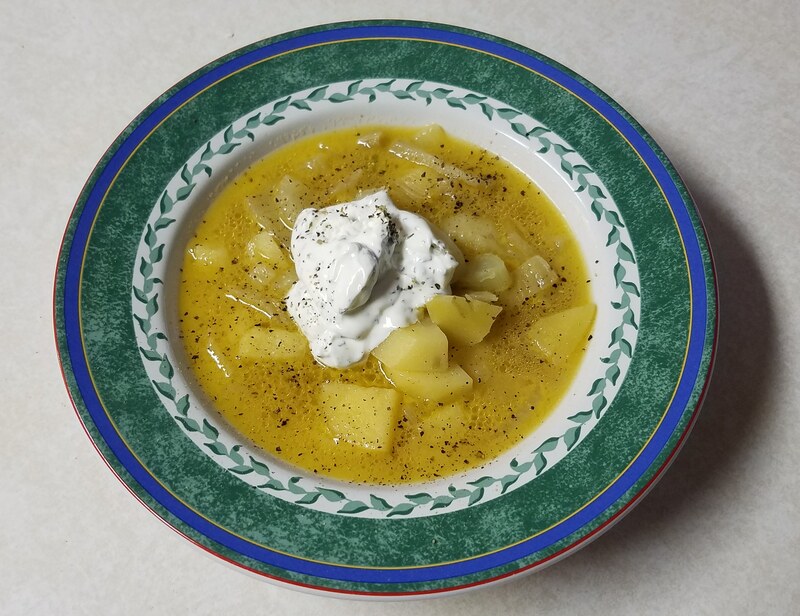 I made a test batch of fennel potato soup while the broth was bubbling. Melt two tablespoons of butter in a small skillet. Clean and slice a bulb of fennel into spoon-sized pieces and fry it in the melted butter until it begins to soften. Turn off the heat. In a saucepan cover seven or eight small, peeled and diced potatoes with vegetable broth and bring to a boil. Add the fennel and butter mixture then salt to taste. Add broth to cover again. Return the soup to a boil then reduce to a simmer. Cook until the vegetables are soft and serve with a dollop of sour cream and salt and pepper to taste. This weekend was the kick-off of GOTV (Get Out The Vote) for Democrats, and I’m sorry to have missed the action. Between scheduled work and being sick, there was no time to do much but generate sales for tissue manufacturers. I followed along on social media, but that’s not the same as being there. I don’t have any predictions about the results, and based on the 2016 presidential race, don’t plan to make any. What I do know is more people I know are engaged this year than since 2006. That’s a positive sign for Democrats. Republicans seem to be using an outdated playbook. A group called the Congressional Leadership Fund spent almost half a million dollars on behalf of Congressman Rod Blum in the First Congressional District to scare us about Abby Finkenauer who is leading in the polls. They warn us she wants to create more “sanctuary cities” and team up with Nancy Pelosi to implement an extreme liberal agenda. Despite the scary music in the internet spots, there are no sanctuary cities in Iowa and it remains unknown if the U.S. House of Representatives will flip to Democratic or whether Pelosi will be elected speaker if it does. Voters who might respond favorably to these ads have been conditioned by the rise of right wing radio and to a lesser extent, FOX News. Accepting these ads may not be reasoned, but it’s in their wheelhouse, and something of a concern. What I see locally is the same Republican candidate placing the same campaign lawn signs in the same places as he has done since first elected in 2012. It’s clear his segment of the electorate is not growing and that’s good news for the Democratic candidate. Our gubernatorial candidate Fred Hubbell led in the last polling. Republicans handed Democrats a full quiver to use this cycle. Between their malpractice on privatization of Medicaid, alienating large numbers of voters over abortion rights, and getting teachers and other public employees mad over changes to collective bargaining, there is plenty to shoot down the incumbent. There is so much to talk about Democrats should disband the party if they can’t win the governor’s race this cycle. If we do win, we’ll be able to check the most egregious aspects of the Republican agenda going forward. I guess I’m getting over my sickness if I can write about two of my favorite things, local food and politics. After I post this I’ll head upstairs, have leftover soup for breakfast and see if I can get feeling well enough to go to the orchard for a my shift. There’s kale to pick before the hard frost leading to winter. This entry was posted in Cooking, Garden, Local Food and tagged cooking, local food, politics, recipes. Bookmark the permalink. This soup looks great; I love the flavor of fennel. Glad that you’re starting to feel better! I only use vegetable broth and the difference is using plenty of different kinds of greens for the flavor. Of course, carrot, celery and onion are pretty basic. Enjoy the rest of your weekend!